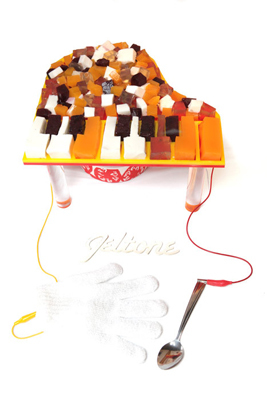 The Resistor JelTone is an edible toy piano created by NYC Resistor members Ranjit Bhatnagar, Astrida Valigorsky, Mimi Hui and myself for the Jello Mold Competition. As part of our experiments we realized that jello and fruit, which contain a lot of water, are conductive. Embedded in each jello/fruit key is a sterling silver pin (food safe) connected to an Arduino microcontroller underneath the piano’s base. Below the piano’s case is another sterling silver pin. With this setup, the JelTone can either be played with a metal utensil connected to the Arduino, gloves enhanced with conductive thread, or bare hands by touching both a key and the piano’s case. If you’d like to make your own, you can get the project files, code and instructions from Thingiverse. 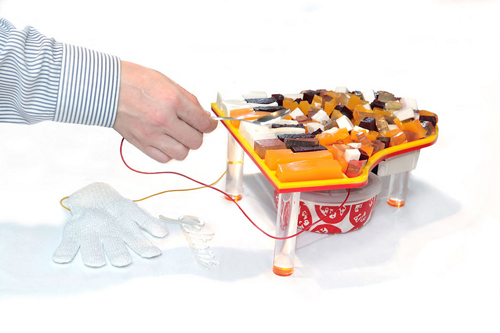 The JelTone (in its jello and fruit versions) was exhibited and eaten at the 2011 Solid Sound Festival (Mass MoCA), the Jello Mold Competition (where it was awarded the creativity prize), the NY Hall of Science “Dead or Alive” Halloween Festivities, the Toy Piano Festival, and the Guthman Musical Instrument Competition.